We are proud to announce our first team of people walking to raise funds in Scotland’s Kiltwalk! A new ME-themed clothing and bag-range available to purchase online. We are thrilled to announce The Karmann Ghia Owners Club (GB) as our first ever Charity Partner. It doesn’t matter what you do, just so long as you do something. Anything. Let’s make this the biggest and best ME Awareness Week yet! We discuss what the new research means and how the Biobank contribution continues to evolve. Here to listen. Here to help. 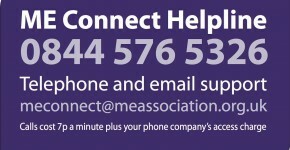 ME Connect is a helpline service offering telephone and email support. Calls cost 7p per minute plus your phone company’s access charge. Calls from mobiles can be considerably more expensive than from a landline. Go Blue for M.E. in May and help us tell the world that M.E. is Real and needs Real action to help Real people. 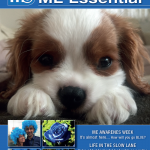 Looking ahead to ME Awareness Week, ME Essential is a bumper 60-page edition! 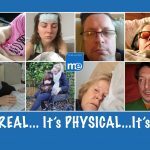 News, research and your stories about life with M.E. 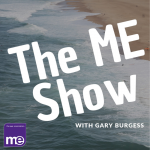 Gary Burgess returns with Season Two of the popular podcast series – and talks about the issues affecting people with M.E. A few years ago, Laura made an online comic to explain Post-Exertional Malaise (PEM). "I find explaining Post-Exertional Malaise to people to be incredibly difficult and this is the reason I set about creating this comic. It is hard to see how truly ill a person is when the worst of it happens behind closed doors. However, something I would like to add is that there is also a lot going on beneath the surface of someone with ME when they are over-exerting themselves like this even though they may seem okay". See Laura's comic on her website. That's the promise from Health and Social Care Minister David Ashford, after more than 1,200 people signed a petition calling for more to be done to help those with the condition. ‘Wonderful news’ as Mid Sussex charity awarded £5,000! The charity, reMEmber, for people with ME (Chronic Fatigue Syndrome), has been awarded the grant by the Sussex Community Foundation for its Clinical Network and Children’s Service Project. The charity has also received a grant of £100 from Haywards Heath Town Council towards its annual ME Awareness Conference on Saturday 11th May. 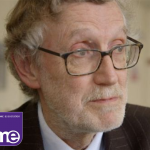 There will be two expert presenters at the conference, Dr Charles Shepherd and Nina Muirhead who is a surgeon. They are both long-term ME sufferers. Social media can often be difficult for those with an invisible illness, and many face criticism from those who don’t understand that what they see online doesn’t always reflect reality. Lauren, who has M.E. and fibromyalgia, shares how she’s using Instagrammable content with honest captions to raise awareness. "Now I have got a little bit better at explaining that I am not well, but it's quite hard because all of my friends are going out or have their own families, and I just can't do that right now, but people don't really understand that. "I do think people kind of judge you from your pictures, that why I prefer posting honest captions so people understand that Instagram doesn't really show you real life. "People don't understand it if it's not in their world, you have to see first hand how it can affect someone, but you shouldn't judge people just based on what they look like." In addition to ME/CFS, do you have a diagnosis of any of the following conditions?